Let me preface this blog post with a warning. You are reading a blog about intestines. Intestines make poop. Also, when intestines get sick, all kinds of bad things happen. Patrick got sick today. And we have blog followers who have enough medical need-to-know that I will be writing about yucky poopy things. If you don’t want to read about yucky poopy things, then know that Patrick was admitted to the hospital today with norovirus, an intestinal virus, that has made him very sick and with his compromised immune system is dangerous. We don’t know what this means for him or how long we will be here, but he is feeling yucky and scared, but so far ok.
Now, disclaimer done. Here is how today went. Patrick went to bed happy last night. In fact, so happy that he laid in bed and tried to learn about rhyming words with me for an hour. He was still sleeping well at 2:30 when I refilled his formula. But at 5:30, when he woke up, he sounded pretty unhappy. This is a usual time for him to request me to come lay with him. So I went and laid down with him and he slept until 6:30 when he started doing all kind of things that he knows hurt me and wake me up. I am a slow learner and forget that this behavior means that Patrick is trying to get attention because something is wrong. He was obviously was exhausted, as we all were, so I kept trying to get him to sleep and he would for a few minutes at a time before pulling my hair or pinching my fingers or banging his hand down on my face again. At 7:15 I decided that we weren’t going to get enough sleep if I got him back to sleep, given it was lab day, so I got out of bed. Something about Patrick’s smell made me think he needed to be cleaned up. So I took him immediately to shower, much to his displeasure. Well, he wouldn’t stand up straight. Just kept leaning on everything and was very whiny and then, as I took off his diaper, I noticed that he was acting queasy and that his belly looked kind of round. I poked. It was hard. So I grabbed a diaper and I told him I thought he needed to poop. He did. And he went and he went and in seconds the diaper was full and his legs were wet and, given that Patrick’s stool has been solid or at least mushy for weeks, I knew something was wrong. But now he really needed a shower. And a shower actually seemed to make him feel better. Brian and I talked and decided that maybe Patrick had eaten something he was allergic to the night before, as he’d been in the mood to try all kinds of new foods. 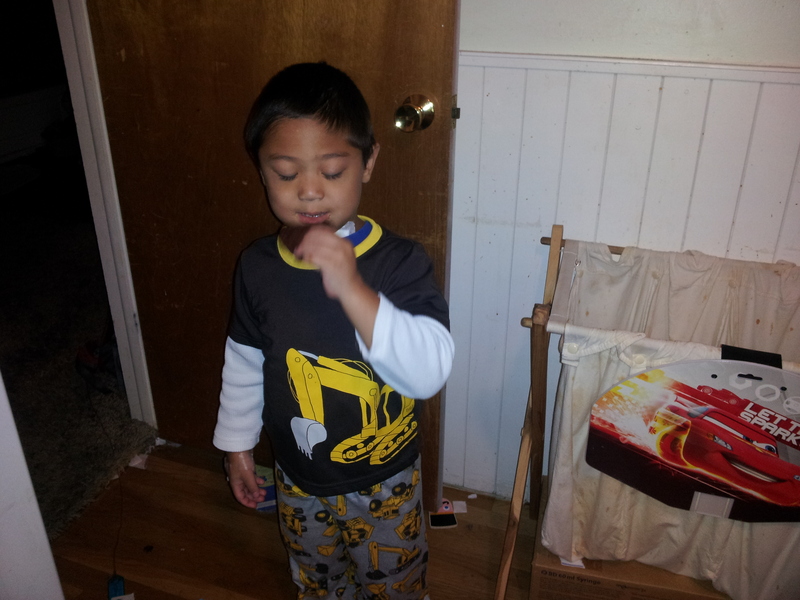 So we got him dressed and watching TV on his bed and we cleaned up the room and got dressed. And at 8:30 his nurse came and he seemed fine.. But then we made him sit up so she could listen to his heart. And he threw up all over both of us. She managed to get labs drawn, but by the time she left, we could tell that Patrick was more than just a little bit sick. So, I called and left a message for the team and we stripped the bed and started some laundry and got permission to eat in our room. Finally, around 10, the nurse coordinator called me back and asked me what our instinct was. I told her it seemed like a virus. But that I didn’t know what that meant we should do. She consulted with the nurse practitioner who calls the shots, and then called back to say that they wanted him to come in. Checking in wasn’t easy. Even years after our zip code was changed, the computer system here seems to hate our new zip code. It took over half an hour to get Patrick registered and meanwhile he had to go again, and made quite the puddle in both of our laps when his diaper leaked.. and he was trying his best not to throw up. And finally the woman at the desk called it good enough and brought us upstairs while Brian stayed to try to sort out the registration. They did a full workup when we came in with cultures and viral panels and stool cultures. We just heard back that Patrick has norovirus. This is a pretty common and contagious stomach virus that, for many people, would cause an upset stomach for a day or two. It has a reputation for floating around the Ronald McDonald House. For Patrick, on immune suppressants and with a brand new intestine, we don’t know what it will mean. For today, it means smelly liquid stool and nausea and a low-grade fever. He has spent the day laying in bed.. sleeping some. Whining a lot. Begging for water. And lying and saying that he is “all better” and “I feel great.” He’s on IV fluids and not allowed to eat or drink. Once he got an IV bolus of fluid, he started looking and feeling better. He is arguing over everything and saying “ow” or “stop that” over the slightest touches. (Not sure they hurt. He may just be defensive.) I think he’s finally past the initial anxiety of the hospital admission. So the plan for now is to wait. There is no treatment for norovirus. Just need to make sure that he stays hydrated, that he absorbs his prograf properly, and that they watch for inflammation that might put his graft at risk. He’ll stay in the hospital, in isolation, until this virus passes. The hospital is very full. We are in the last room, a tiny, outdated, smelly room with construction going on just the other side of the wall. This could be a long wait. But at least we have a room. We are bummed that another daddy visit is being spent in the hospital. I’m a little bit worried, knowing how contagious this bug is and just how many changes of clothes we’ve been through, that I am going to catch this and then I wonder just who will take care of Patrick if I can’t. But only time will tell. We appreciate your ongoing prayers. We know that miracles are wrought by prayer. We have seen it over and over again in the past few months. So please keep those prayers coming. This entry was posted in Immune suppression and illness, Life as an SBS mom, Transplant and tagged home health care, hospital stays, intestinal transplant, norovirus, prayer, University of Nebraska Medical Center on January 23, 2015 by geekino. This picture kind of tells most of the big news of the day. Look closely and you’ll see a few things. 1) Patrick was able to wean off of oxygen to room air during the night last night. That means no more nasal cannula. 2) They decided that his g-tube was providing sufficient drainage for his belly. He’s still having bleeding, but no apparent side effects. They have been trying to clamp his belly periodically throughout the day. If things continue going well, they’ll start feeds through his belly soon. 3) Patrick lost his first tooth. We noticed a loose tooth a week ago as Patrick was leaving his class Halloween party. When he went to the OR, the anethesiologist said he’d pull it so it wasn’t a choking risk. Then the report came back that it wasn’t loose enough yet. Well, today it was quite wiggly. And tonight, as I was putting Patrick to bed I noticed it was missing. He was terrified. He thought something really bad had happened and insisted we needed to press the nurse call to take care of this big emergency. It took a while to calm him down. Then his nurse came in and helped me make a big deal about it. We called some other family so he could tell them and after a little bit of celebration, was proud and not scared. We’ve told him the tooth fairy will take care of finding it in his bed and he’s excited about finding some coins there. Other big moments of the day: Patrick had his first scope. This is the entire reason that Patrick has an ostomy right now.. so they can easily look inside and check his intestine for rejection. They brought the scope right to the bedside. Patrick was pretty worried, especially as this happened first thing in the morning. But the doctors did a great job of putting him at ease, showing off the equipment, etc. Because there aren’t pain nerves in the intestine, they can just do the scope right at the bedside… Just slip in the scope, look around, take a biopsy and done. The longest amount of time was spent taking off Patrick’s ostomy bag so they could easily reach where they needed to. He was downright adorable the whole time.. and when they sent a puff of air in to open the intestine (they said this might be uncomfortable), Patrick just giggled and said it tickled. Whew! We are doing those at least weekly for the next month and then very regularly for up to a year.. and so it was a huge relief that he wasn’t scared by it. Really, our only scary moment today was walking. Physical therapy came and because we’d had all the excitement of a scope, a bath, two tubes and lots of adhesive removed all in the wee hours of the morning, Patrick was just plain tired. Also, with all of that going on, I don’t think they had been very consistent with pain medicine. Anyway, he made it out to the goal they’d set and was doing so well, they decided to push for a few more feet. Only, he was hurting and didn’t want to go 2 more feet. He just sat down on the floor and cried. (This is a problem on so many levels when it comes to protecting an incision and protecting an immune system.) It took a good 10 minutes to coax him into walking back to the room and then, only with me hugging him the whole way. Really, it was a pretty good day overall. He napped for almost 3 hours on my lap after his walk.. then I took a break and went back to my room for my own nap. We’ve played all evening and are just getting ready for bed. One more thought, though.. Mail time is quickly becoming our best time of day. Patrick loves opening all of his birthday cards.. Some of the messages and other gifts leave me in tears. We should be moving out of the ICU soon and plan to plaster the walls with them. I’m not sure there will be even an inch of spare space. I can’t believe that a week ago at this time, Patrick’s team was getting a call that Patrick had been matched with a donor for a long-anticipated transplant. It breaks my heart to consider what the donor family was going through at that moment while we, completely unaware, were putting the finishing touches on Patrick’s birthday present and plans. How quickly life can change. This entry was posted in Aunts Uncles & Cousins, Development, Family, Life as an SBS mom, Medical updates, Organ Donation, Patrick, Recovery, Transplant and tagged firsts, growing up, hospital stays, organ donation, physical therapy, PICU, prayer, special needs parenting, transplant on November 7, 2014 by geekino. So, in tribute to all of you, and in answer to the dozens of people who have asked for ways to help over the past few weeks, I thought I’d pass our waiting room time bragging about some of the ways we’ve been helped over the years. 1. Visits.. It doesn’t matter if we’re at home or in the hospital. A new person always lightens and lifts the mood. For example, last hospital stay one of our friends was brought to the hospital for work and found herself with some extra time. She texted and asked if it was a good time to stop by. She came and, because Patrick needed out of the room, we walked down to the playroom. That’s when we discovered his line had broken and we turned around and headed back to the room. She walked with us, and as nurses swarmed the room to help the problem, noticed that the breakfast cart had come. So she went and picked up a muffin and milk for me. I share this story for two reasons. First, it shows that you might just dive into chaos and wonder if you’re in the way. The truth is that Patrick talks about who visited all day long, whether the visit was at a “good time” or not, whether we actually had time to chat and play or not. When we got home, another friend came to visit and brought a few new toys and a balloon. (New distractions are always a big help). Patrick’s talking about that visit a week later. We get lonely. We get sick of each other. We need our days broken up. We may not be great hosts, but just your presence helps. 2. Food. In the Mormon world, bringing food is something we’re exceptional at. And believe it or not, it really helps. On the return from one hospital stay, a friend showed up with a pan of uncooked enchiladas. It was a few days later when we got to cooking them, but it was so nice to have a prepared meal in the fridge. Once we returned home from a trip to find a pizza on the porch. And you may remember when we charged a cookie entrance fee to visit Patrick in the PICU. Those cookies were needed sugar during time when we rarely wanted to leave Patrick’s side, and a lot of fun to share with nurses and other hospital staff and patients as we had so many of them that we couldn’t eat them all. In the hospital, lunches are especially challenging for me. I often can’t get out of the room to get something to eat. Once, I picked up the phone to order room service to the ER 10 times in an hour and never could stay on the phone long enough to place an order. I often just skip lunch when Patrick is hospitalized. But I’m a grumpy bear when I’m hungry. Food helps me be a better mom. I love our family who faithfully pack Sunday picnic lunches to eat on the patio? Even though the medflight helicopters blow all of the food away when they take off and land? And I love my mom who often things to bring along things like fresh fruit and vegetables. 3. Play time. You’d have to not be looking to miss that Patrick is a VERY active and playful little boy. He wants to be doing something every moment and if he gets bored can stumble into trouble very quickly. One of the biggest helps for me is when someone will come to play. For this entire summer, my next door neighbor’s youngest daughter has been coming over to play with Patrick. She has so much more energy than me and is more than happy to push him all around the backyard in his stroller to make him laugh, or to read books, or to do crafts. We’ve even taken a couple of field trips to a nearby splash pad. Because Patrick’s an only child, having another child to play with is an amazing gift for him. And for me? It gives me a short break from being the one who thinks of fun things to do. Playdates are an amazing help. The patient practice Patrick gets playing with other kids. Often they come at moments where you may wonder why we’re crazy enough to go out, but it offers just the break and distraction we needed. I’ve had teenagers come to play while I did dishes and another friend come bring the most amazing craft and science projects. I’ve even had friends ride along to doctor’s appointments to play with Patrick in the waiting room. Patrick is so happy to have the company.. And any opportunity to wipe down counters, fold some laundry, load a dishwasher without little helping hands helps me. 4. Help with the chores. That brings me to my next topic. Chores. I always have more things on my to do list than I have done. Especially since conversations with doctors, appointments, hands-on medical care, and quality time with Patrick trump household duties quite often. My little sister is awesome about this. She often comes by in the afternoon after school or work and helps me put the toys back in the toybox, sweep, prep dinner, iron, etc. If Patrick wakes up while we’re working, she takes him to play and lets me finish. When Patrick was coming home from the NICU, a “cleaning crew” from our church came and sanitized the house. And one sweet lady took about a dozen shirts from me, ironed them, and brought them back to put away. I’ve had people take home our laundry, wash, and return it. We’ve had neighbors water and mow our lawn, pick up our mail, bring in our garbage cans. And on and on. It makes a home feel so peaceful when it is clean. And often, helping me clean is easier than helping with Patrick. 5. Help in medical moments. I have to give a special shout out to friends, neighbors, and family who have stepped up and learned to do things they never imagined they’d need. You have prepped TPN, given meds through a g-tube, changed countless central line dressings, restrained Patrick so I could change a button, clamped off broken lines, treated allergic reactions, caught vomit, changed diapers with our crazy diaper cream regimen, sat with a febrile little boy so I could pack a hospital bag, and on and on. And, in what is the one of the smallest and biggest things you do, you have carried Patrick’s backpack while he explored so we could sit down. We are a part of a very, very lucky and small minority of special-needs, and especially short gut, parents who have not just one but several people we can call on in these moments. Because of you, we still make it to the temple sometimes, catch a hockey game, see a movie, and go on dates. You make it so he can go to Primary at church with the other children. You get me to the dentist. You let me nap. 5. Listen. You read my blog. You follow us on facebook. You help us troubleshoot. (Like the onesie pattern that Brian’s mom and I developed over the years to keep his line and button safe at night… or the countless little issues solved by brainstorming with other short gut families online.) You chat. You call. You stop and give me a hug and let me cry without saying anything at all. 6. Prayer. And, when you can do nothing more, you pray for us. I have felt us lifted up by your prayers. I have felt the peace of your prayers. And I have seen countless medical miracles because of your prayers. Thank you for thinking of us, praying for us, and keeping our names on prayer rolls and in prayer groups and flickering in the flame of sacred candles. Thank you. Thank you. Thank you! How would we have made it this far without you? And thank you for continuing to offer your help. I hope this brag list helps answer your question of how you can (or already do) help. This entry was posted in Faith, Family, Friends, LDS Church, Life as an SBS mom, Parenthood and tagged brag list, faith, friends, helpers, hospital stays, prayer, Ronald McDonald House, special needs parenting on September 6, 2013 by geekino. Patrick insisted I take this picture of him eating an applesauce cookie. So good to see him with an appetite again. I truly feel like getting Patrick a line through his interior jugular vein into his azygus vein was a miracle. An absolute answer to prayer. So I was more than a little confused with the phone call I received from Patrick’s transplant nurse coordinator yesterday. In the morning when we talked, she was quite pleased with the ingenuity of Patrick’s line placement and thrilled to hear he was doing well. We discussed infection prevention strategies and his position on the transplant list. Then she called me back in the afternoon. She’d updated one of the transplant surgeons. And, as it turns out, in order to perform an intestinal transplant surgery, you have to have a central line in the superior vena cava. It can’t be in the azygus vein. The logistics don’t work. They asked us to fly Patrick there next week to let their specialists see if they can solve the problem. Until it is resolved, Patrick has been put on hold on the transplant list. At this point, other than knowing that the insurance company has approved the trip, that is all we know. We have about three dozen questions that we don’t know the answers to. Despite the news, Patrick is doing great. Infection free and bacterial overgrowth at a minimum, he is feeling great. He ate at all three meals and had several snacks today, too. I swear he was eating once an hour. He’s napping well. He’s playing happily. He is very confused about why mommy is in a bad mood. Mommy is doing her best not to be overcome by her tendency towards catastrophic thinking. At least I have plenty of distractions. Hospital stay followed by a week of travel followed by another hospital stay is not the way to stay on top of your housework. And I’m nowhere near ready for Patrick to go back to school, even, or perhaps especially, if we might miss the first day next week. We are hoping to get some answers soon. Thank you for your prayers. I know they’re helping. If you don’t mind, we could really still use them for a little while. This entry was posted in Bacterial overgrowth, Central Line, Medical updates, Patrick, Short Gut Syndrome, Transplant and tagged central lines, IV's, learning to eat, miracles, prayer, preparing for transplant, scary moments, transplant, trials and triumphs, University of Nebraska Medical Center on August 31, 2013 by geekino. Patrick and I had the most frustrating of mornings yesterday. Got up as usual and started out happy enough, but then it was time to connect his 8 a.m. antibiotic. I went to withdraw the ethanol lock out of his line and it wouldn’t come. Tried to flush. Wouldn’t budge. So I grabbed a dose of Cathflo (the super declotting agent for central lines that I am learning I am VERY lucky to be allowed to administer by myself at home.) Worked it into the line, which took me almost half an hour. I left it in for half an hour.. drew back and the line drew back beautifully. Tried to flush, and nothing. Let go, and the syringe filled with blood. Not good. I tried several more times and just got the same result. The antibiotic was due. The TPN was running. The two can’t go through the same tube at the same time. And I was stuck. So I called the hospital and asked for the GI on call, but they wouldn’t give them to me because it was almost 9 a.m. and the GI clinic opened at 9. So I called Patrick’s nurse, and she was stumped. She called the department at the hospital that specialized in central line repairs, and they were stumped. Finally, Dr. Jackson’s nurse got word I was calling and called me back. And she was stumped. It really seemed like the blood was flowing backwards in the line.. out instead of in. Which either meant a slipped placement.. or a line broken under the skin. So – while they did their research, I did the only thing I could think. I said a prayer. I put one more dose of TPA in the line. I forwarded our home number to my cell phone. Then, I packed Patrick up and we went to mommy-and-me exercise class. Makes sense, right? We needed some normal, and some distraction. And it was his last guaranteed chance to go to class before school. Halfway through exercise class, as I was sweating and huffing and puffing… in the middle of the popcorn song where we jump all around the room pretending to be popcorn… my phone rang. It was Dr. Jackson’s nurse telling me that they’d arranged an admission to the Rapid Treatment Unit. The plan was to evaluate the problem, do an x-ray if possible, have the IV team look at things. And then, she said, it didn’t look good. I hung up and stayed till the end of exercise class. Why not? Then we came home, I showered, and I packed a suitcase to see us through a one day hospital stay and a likely surgery. And then tested the line. And the 2nd dose of TPA had fixed the problem. Best bet? That the clot was working like a stopper that allowed blood to flow in, but not to flush. Kind of the opposite of usual line function. And that it was blood trapped in the line that was flowing back after attempts to flush… Not the line bleeding as it appeared. We called it a nurse visit. The doctor came to “not” consult with me, so we wouldn’t be billed for the service. He’s seen us struggle to keep this malfunctioning line going for the past 15 months. I asked him if he’d give up and replace it yet. Knowing the risks of lost access for Patrick. How often that is true with Short Gut. How often do we weigh the choice between the familiar but uncomfortable present situation and the risk of an uncertain outcome? The choice about transplant is certainly that kind of a thing. It takes a lot of faith and prayer and hope and stepping into the darkness to move along this journey. And a lot of mornings derailed by emergency hospital admissions that leave dirty dishes and dirty laundry and a mountain of other unfinished tasks while we wrestle with uglier demons. Brian and I have been doing a lot of pondering and praying to know what is the best choice about this troublesome line. If you’re praying for us, that would be a good thing to pray for. For us to know whether to keep fighting with this line or take the risk of swapping it out in the hopes of fewer infections and clots and frustrating mornings. This entry was posted in Central Line, Life as an SBS mom, Medical updates, Parenthood, Short Gut Syndrome and tagged Broviac line, central lines, frustrating moments, hospital stays, IV's, miracles, nurses, prayer, Primary Children's Hospital, scary moments, special needs parenting, TPA, transplant, trials and triumphs on August 16, 2013 by geekino. Why do I remember that? Well, because exactly two years ago yesterday, the court officially named us as Patrick’s legal guardians. It was the best birthday present I’ve ever gotten. A friend of mine has been doing something special this month on her blog. Because it’s national adoption awareness month, she’s been posting daily adoption related posts. She invited me to be a guest blogger and, by coincidence, will be running my post today… a very significant 2 year adoption anniversary for us. Ours is not a typical adoption story, because Patrick is not a typical little boy. His life was meant to be something different, something miraculous, and so it required that it start in a very different and miraculous way. But my part of the story starts the way a lot of others do. We wanted to have children. When that didn’t happen easily, we involved doctors. For years, we went through the ups and downs of charting and temperature taking, tests and medications. Finally, after several years and a minor surgery, our doctor sat us down for “the talk.” He explained that there were several causes of my infertility. The cards were, essentially, stacked against us. He still felt it very possible that we could have children, but only with major medical intervention. We had some big choices to make. We talked about it and we prayed about it. And then, that Sunday, as we sat in church, we received a clear answer that it was time for us to stop medical treatments. Our child would come to us through adoption. With a path finally before us, we moved forward quickly. I’ve never felt so driven to do anything before in my life. In under a month, we completed the application process, training classes, and were mostly done with our home study. During our home visit, we had a conversation with our case worker that would play a major part in bringing Patrick into our family. She’d looked at our “preferences checklist” and noted that we seemed more open than most to adopting a child with special needs. We explained that we felt that adoption was a faith process. We believe that Heavenly Father puts families together. We knew we’d never turn away a child born to us with medical problems. So, if God was in charge of adoptions, too, then why would we limit His options? We knew Heavenly Father would help us find our child and that, if the child really belonged in our family, race and health wouldn’t stand in the way. We decided to adopt in June. Our application was approved in September and we hunkered down for a nice long wait. We figured two years, at the least, was the average we’d heard. And still, by the end of October it felt like far too long. My heart ached for a child it knew was missing. Then, on a very snowy morning the first week of November, my phone rang. It was my case worker. She started out by saying, “There was a little boy born on Halloween in Michigan.” My heart skipped a beat. I grabbed a pen and a piece of paper and started scribbling notes. She told me he was Korean. And then, she went on to tell me that he’d had a birth defect. His intestines had developed on the outside of his abdomen. The doctors were saying he had a life expectancy of 1 to 2 years. They needed to find an adoptive home quickly because doctors wanted to discharge him from the hospital. All she could tell me about his family that his birth mother wanted him to be able to go to the temple to be sealed to a family. She said she’d send an e-mail with more information and a picture. She encouraged me to talk to Brian and decide if we’d like to be among those families considered to adopt this little boy, and then to call her and let her know. As soon as I gathered myself, I called Brian. But he wasn’t at his desk. Meanwhile, two e-mails arrived. One was a short paragraph from the baby’s caseworker in Michigan explaining his medical needs and the unconventional and hurried search for parents. In the other were two photographs of a sweet little Korean boy with great big eyes and an IV in his head. Since Brian wasn’t at his desk, I called the insurance company to find out if this we even had coverage to pay for this kind of medical problem. That’s how Brian first found out about the offer. While I was on hold with the insurance company, he called back on my cell phone, so he heard me finish the conversation about “preexisting conditions” and “adoption”. I gave Brian the information and, after a quick moment of thought, he said he’d come right home. We had a prayer together, then went to the temple – the perfect setting to make decisions about life and death and eternity. I knew that families are eternal. I knew that mortality is not the end of life. And yet, I was filled with grief. It was as if I’d just been told I was carrying a child with a terminal illness, but he wasn’t even mine yet. And I was scared. I didn’t know if I was ready to leave the life I knew then.. abandon it all, and become mom to a child who would need so much help, and who had such an uncertain future. Still, when Brian turned to me and said, “I think we should pursue this,” my heart leapt with joy. That was Wednesday. Thursday, I sent a copy of our profile. Friday afternoon, as I on my lunch break with Brian, our case worker called my cell phone. The birth family had seen our profile and had chosen us to adopt their baby. Now, we had a choice to make. Because we’d been selected, we could finally start filling in the gaps in the medical information we were getting. And boy, where there gaps! We called the baby’s caseworker, who referred us to the hospital social worker. Finally, we decided we needed to talk to doctors, and we needed to do it face to face. I called my mom and told her to take my credit card and buy airplane tickets. Then, I went back to work, explained what had happened, and asked for a leave of absence. After that, we went to the adoption agency where we signed pre-placement paperwork required for us see the baby in the hospital. Friday night, we tried to get ready. We booked a long-term stay hotel room. We faxed legal documents to Michigan. We make a shopping list of nursery items. And we tried to pack. I packed my bags that night not knowing what exactly I was packing for. We still didn’t know enough to say if we could take care of this baby. We didn’t know if or when he’d be discharged. We didn’t know how long it would take before we’d be given permission to leave the state again. And yet, Saturday morning as I sat on a plane to Detroit, 10 rows ahead of my husband, I felt a quiet, happy calm. If nothing else, I knew it would be ok.
We met Patrick, his family, and his doctor Saturday night. It wasn’t what we expected. Due to unforeseen problems, things were tense at the hospital when we arrived. We felt like we knew nothing at all about his condition when we heard the doctor’s account. His case was much more severe than we’d understood, but the immediate prognosis was better. At last, they led us to his room. My first impression was of how small he was. He was SO tiny! Just a little ball with wires and tubes attached. Without them, you’d have never guessed there was anything wrong. They let me hold him while we talked. He felt so small and fragile. I thought that the moment I met my baby, or the moment I held him, that I’d know he was mine. But that isn’t what happened for me. There were too many questions, still and I’d have to wait for that confirmation. Sunday, we arranged to spend the day with Patrick. The nurses were so kind to let us change his diapers and help with other aspects of his care. I sat for hours singing him lullabies and watching monitors and letting him sleep. When we arrived, the nurses warned us that he had a reputation as a very irritable little boy. There was even a sign on his door warning not to wake him. He was famous for screaming hysterically if his sleep was interrupted. But that’s not the baby I met. He was just a sweet, tiny little boy who wanted to be held. I remember singing to him: “I am a child of God, and he has sent me here. Has given me an earthly home with parents kind and dear.” And my voice choked on the words because I knew that right at that moment, Patrick didn’t have that. I couldn’t imagine how any little boy could go through all he’d need to go through alone. That night, as we looked at pictures from the day, I came across one that showed just his face with a white background. I knew, when I saw that picture, that I loved him.. and I wanted to keep him. Monday morning, we held a “family conference.” It was a business day so we finally had been able to confirm that there were doctors to take care of him at our hospital at home. Our insurance confirmed that he’d be covered. Brian needed to hop on a plane to go back to work. (He was running a conference that week.) So, knowing we had the resources to provide for his physical needs, we asked Patrick if he’d like to be a part of our family. I swear, he looked up at Brian and smiled. The case worker rushed to the hospital and by 1, we’d signed paperwork, and I was on my way to the airport with my husband. I was staying behind to start a whole new life. The next few weeks in Michigan are among the sweetest of my life. With nothing else to do but hold my new baby and learn to care for him, I virtually lived in the NICU. My mom came for a week and shared with me in Patrick’s first feeding, first bath, and first time wearing real clothes. This time was also some of the hardest I’d experienced as I received a trial by fire as a mom of a child with major health problems. Patrick had his second surgery the day Brian flew back to be with us. Two weeks after we signed papers, on my birthday, the birth parents appeared in court, and we were named as Patrick’s legal guardians. A week later, we had permission to bring him home. At 4 a.m. Thanksgiving day, Patrick and I arrived at Primary Children’s Hospital by air ambulance. He’d spend the next few weeks there as the doctors here got to know him and made arrangements for us to take care of him at home. Because of his medical needs, the courts granted an early finalization of his adoption and we were able to take Patrick to the temple to be sealed as a forever family in February when he was just 4 months old. Patrick just turned 2. He is an active, happy toddler who loves cars and music and Elmo. He is a living miracle! Patrick’s birth defect came with a rare complication. As a result, at birth he was missing over 95% of his small intestine. Without intestine, he doesn’t get nutrition by eating. In fact, eating large amounts puts him at risk for dehydration and bowel obstruction. Instead, he is entirely dependent on a form of IV nutrition called TPN. He has a permanent IV tunneled through his chest, into a vein in his chest or neck that runs to his heart. The TPN leads to complications like infection and liver disease. In his short 2 years of life he has already struggled with both. Patrick’s doctors warned us before we adopted him that we’d become such regulars in the E.R. that we’d be on a first name basis with the staff. We soon found that to be true not just for the E.R. staff, but also the IV team, the infectious disease team, the PICU team, most of the residents, several of the medical students, and the entire gastroenterology department. At 9 months old, as a result of infection, Patrick’s heart stopped. The fact that he is alive now is nothing short of a miracle. No doctor who hears his story and then meets him can help but confess that he has beaten the odds in countless ways. Patrick will eventually need an intestinal transplant. He is already running out of places to put new IV’s and each new infection makes him a little more fragile. Since they don’t do intestinal transplants where we live, we have chosen to have Patrick listed at Seattle Children’s Hospital. Patrick has been on the waiting list since April of 2009. He is status 1A and will have his transplant is soon as a donor match is found. People try to tell us sometimes what a tremendous thing we did in adopting Patrick. We don’t really feel it’s something we can take credit for. As we told our caseworker when this all started, Heavenly Father puts families together. He knew Patrick needed us. And what’s more, He knew we needed Patrick. Raising Patrick has taught us more about life than any other experience. We have learned to rely entirely on the Lord. We have learned to live each moment to it’s fullest. We have learned to lean on one another when things are hard and we to trust in hands of friends and strangers when we felt too weak to stand on our own. And we have learned to love like we didn’t know it was possible to love. This entry was posted in Adoption, Faith, Families are forever, Infections, Liver problems, Medical updates, Parenthood, Patrick, Short Gut 101, Short Gut Syndrome, Special Needs Adoption, TPN and tagged adoption, adoption application, adoption finalization, adoption profile, air ambulance, birthparents, cardiac arrest, faith, families are forever, favorites, grandma & grandpa, infections, infertility, insurance, liver woes, miracles, NICU, nurses, prayer, priesthood, Primary Children's Hospital, prognosis, Seattle Children's Hospital, short gut 101, short gut syndrome, special needs adoption, surgery, temple, TPN, transplant, transracial adoption, vascular access on November 19, 2010 by geekino. Since Patrick came into our family, we’ve made several attempts at a vacation… and all in vain. For a while, I superstitiously didn’t even want to say the word, for fear that it would end up with another infection. It seemed that the bigger the plans, the bigger the catastrophe. But.. several months ago, when Brian’s parents suggested a trip to Yellowstone with his family, we couldn’t resist the chance to make another attempt. We booked a room, cleaned our house, packed our bags. With each step closer, I just kept waiting for the hammer to drop. On the 5th, Patrick’s line sprung a pinhole sized leak. It wasn’t even visible.. but the line pulled air when I tried to draw back and sprayed when we flushed it. So we ran up to the hospital to have it repaired. All went smoothly, especially for 5 p.m. on a holiday. We even made it to a family dinner, just a little late. Patrick with line newly repaired modeling some of the sterile gear required. The next day, just after I connected the TPN to the repaired side of the tubing, Patrick stepped on the tubing. The glue used to repair a central line takes 3 days to fully cure, and the tug from stepping on it was just enough to undo the repair. It set back my packing several hours, but we ran up to the hospital and got the repair done. We were still going to make it, darn it! I stayed up late packing, then the next morning got up at 7 to drive Brian to work. All day long, I worked to get ready and was stunned to find myself actually loading up the car. Patrick had an appointment with his GI in the afternoon. The plan was we’d go to the appointment, then pick Brian up from his office, and head north to Yellowstone. I was grinning ear to ear as I left the appointment, knowing we were on the road at last. I was so anxious to go that I even did Patrick’s TPN tubing change in the back seat as Brian drove so we’d get out of town before rush hour. An hour and a half north of Salt Lake we stopped at a rest stop outside of Malad. Patrick needed a diaper change. As I was taking him out of his carseat, his tubing caught on the buckles. The repair came apart, again. We had to decide what to do next. It was an hour and a half back to Primary Children’s. Or, it was a little more than that to the hospital in Idaho Falls. I’m not sure what possessed us, but we decided we didn’t want to turn back. We’d gone to great lengths to get a spare repair kit to bring with us, just in case. Surely the repair could be done at another hospital. So, we made the quick but nervous drive to the hospital, arriving around 8 p.m. Eastern Idaho Regional Medical Center is one of the best hospitals in Idaho. But it is an adult hospital. Which meant an adult waiting room with scary things like chest pains and seizures, broken bones and more. They were kind and willing to help, but got slammed with these difficult cases all at once, so they asked if we’d mind waiting in the waiting room. Around 10, they finally invited us back to a room. The doctor came in and we tried to explain what was wrong. He seemed a bit stumped about what we were trying to explain about one lumen of a double lumen line being broken. Finally, Brian spoke up and said, “We have a repair kit and know how to do the repair, but we need some supplies and a sterile environment.. and maybe some help.” The doctor agreed to let us do the repair. The nurses did their best to gather up the extra supplies that we needed. they were a bit different than what I’d seen used, but I knew how to use them. They also offered a nurse to be my assistant as we worked. The process of repairing a broken line is a simple one, but must be done just right. First, the people doing the work puts on full sterile gear, including mask, gown, and cap. The line is clamped off so it won’t bleed. Then, the line is sterilized. Using sterile scissors, the broken part of the line is cut off. This cut must be perfectly straight. The repair piece is then connected. It has a tiny metal tube inside you slide into the remaining original line. You test to make sure it flushes and draws without leaking, glue the two pieces together, cover the repair with a protective plastic sleeve, then fill that sleeve with a sterile glue to seal the work. It’s delicate, sterile work.. but not really complicated. It was so strange to be gowning up to do this. I was nervous, but pretty confident. I’d seen this done at least a dozen times.. and twice already this week. Once I started, though, I got scared. Because the line had been repaired (and trimmed) twice in the week already, it was too short to repair just one side. A double lumen line is made of two tubes encased in one that branch out a couple of inches past the insertion point. I had to cut the line where the two tubes were still one.. meaning we had to shut off the TPN for at least 4 hours from when I finished the repair. That added some pressure. Repairing this section is harder, too, as there are two little metal tubes to fit into the two sides of the double lumen tube. The work was more delicate and the fit was more essential. As I worked, I felt like a bumbling idiot. I was guiding the repair. The nurse assisting me had never worked on a line repair before, so she had to follow my instructions. Brian was talking me through it, but had to work to keep Patrick restrained. My first cut was a little crooked and leaked when flushed. The second cut fit. I slid the sleeve on and tried to fill it with glue, only to discover that the glue was slippery! I’d seen nurses struggle with this before, but never imagined that that was the problem. I’d insert the needle into the sleeve to fill it with glue and it would slip out of place. I probably spent 10 minutes or more trying to put the glue in. Finally, it was done. We tested it, dressed it, taped it down as securly as possible, filled the line with heparin so it wouldn’t clot… And the reality sunk in. My repair seemed really sloppy and if I’d screwed up, we were hundreds of miles from home or anywhere that knew how to fix my mistake. And Patrick’s TPN was shut off… couldn’t be restored until the line was fixed and the glue dried for at least 4 hours! I kept my calmest face on as they did a quick discharge… then went to the car, buckled Patrick in, gave him a lollipop to keep his blood sugar up.. then sat down and cried as the impact of what I’d just done sank in. We drove to Rexburg, arriving around midnight. Brian checked us in and we moved the luggage. Patrick loved the hotel room… a suite, so we’d have a fridge for the TPN. He stayed up playing till about 1, when I finally succeeded in singing him to sleep. Then I said some very urgent prayers for help that my feeble attempt would be good enough, and that I would regain a sense of peace and confidence. Then I fell asleep, too. I dreamed all night of broken lines and taking lifeflight to Utah because I’d made a mistake. At 2:30 it was supposed to be safe to use the line again. I got up flushed it slowly… no leaks. Then I started the TPN. I sat up for the next half hour and checked again.. still no leaks. In the morning, we all slept in.. exhausted. I’ve never been so grateful for room darkening curtains in my life! Patrick had slept soundly… no whimpering like he does when TPN isn’t running. I pretty well expected to find him soaked in leaked TPN when I got him up, but the dressing was still dry. The repair held well and is still holding. We ate breakfast, packed our bags, and got on the road again. I can’t describe the feeling of relief and joy as I watched a very happy, healthy Patrick walking along behind the luggage cart on the way out of the hotel. We arrived in West Yellowstone early that afternoon. We’d made it! I’m afraid the stories from the rest of our trip will have to wait for me to write them down in the morning. Needless to say, it was a wonderful week! I am so grateful to a Heavenly Father who understands the importance of small things like finally taking a family vacation and hears and answers prayers to the effect… who helps and guides and sends the Comforter when needed… Who helps to qualify a sometimes awkward, impulsive and anxious mother, with the help of a calm and constant father, to do unimaginable but necessary things – all for the good of her family and child. This entry was posted in Adventures, Brian, Central Line, Life as an SBS mom, Medical updates, Patrick, Vacations, Videos and tagged broken lines, Dr. Jackson, faith, gratitude, line repairs, motherhood, nurses, prayer, Primary Children's Hospital, scary moments, special needs parenting, vacation, Yellowstone on July 11, 2010 by geekino.